Avid’s Pro Tools audio editing software is used by thousands of feature film and television editors, musicians, and sound designers. Have you just begun using this powerful digital audio workstation (DAW)? There’s a lot packed into the app. To get you started, here are 11 clever keyboard shortcuts to help you get a grip on the app, improve your workflow, and supercharge your editing skills. It’s possible to do most of your work by pointing and clicking in Pro Tools windows and menus. After a few days working in this complex app, you’ll notice these random clicks take a lot of time, especially when repeating the same task again and again. Save time by using keyboard shortcuts to accelerate your work. Note: we list Mac commands below. Working on PC? Substitute “control” anytime you see “command,” “alt” when you see “option,” and “start” (Windows) when you see “control. You can save a lot of time before you even begin editing. These shortcuts help set up your workspace and make it more manageable. Note: It’s worth naming your tracks prior to recording or processing on them, as the auto-renamed clips will be named according to the current track name. Have you found your mix desk is overflowing with tracks? Tired of scrolling? Want to see as many channels on the screen at once? Type command-option-m to show narrow mix tracks. What about your edit tracks? Perhaps they’re sprawling down the screen in an endless flow. Of course, you can right-click on the left track edge and select the size. There’s a quicker way. Type control-down arrow to make them smaller (and control-up arrow to make them bigger). 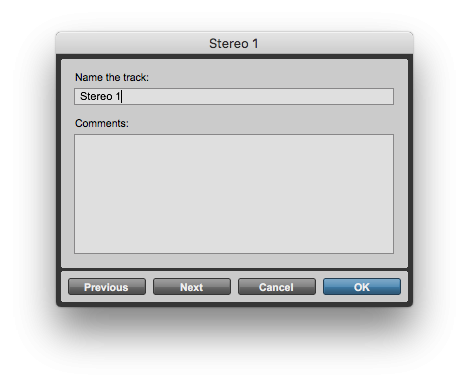 This will change the track selected with the edit cursor. Want to change many tracks? Drag the mouse vertically across many tracks then try the shortcut. All of them will resize. What to change every track? No problem. Type command-option-down arrow to reduce them, and command-option-up arrow to increase them. Now your session is ready to go. It won’t take long before the edit window begins filling with regions scattered throughout your tracks. Here are few tricks to move quickly around the edit window. Have the mix desk in view? Want to see the related track in the edit window? Simple. Just control-shift-click on the mix track name to make the edit window’s track jump immediately into view. It works the opposite way, too: control-shift-click on an edit track name to make the mix desk channel strip jump into view. Imagine you have a sound file with dozens of whooshes. Each of them has five seconds of space in between. Jump from one whoosh to the next by pressing tab via the “tab to transient” function. You can turn tab to transient on and off by clicking an icon in the edit window header. Type command-option-tab to save reaching for the mouse every time. Markers are a good way to make simple session above the edit window timeline like using “Exterior warehouse” and “Interior office” to keep track of scene changes. These will be shown in the marker list (type command-keypad 5 to bring it up). Jump from one marker to the next by typing the keypad-period and the number beside each marker name and then period again. Now that you’re able to move around your tracks more quickly. Let’s see if we can speed up editing the regions. Cycle through each tool’s modes: press the same command again. For example, pressing command-4 will select the grabber tool. Pressing the same key again will select its “Separation” mode, then “Object” mode, before returning its standard mode once more. Need to raise the gain of a region? You may have tried this by clicking the icon in each region’s bottom left corner. There’s a faster way, though. Select the region you want to change and type control-shift-up arrow to increase the gain or control-shift-down arrow to decrease it by the same amount. The default is to change by 0.5 dB, but this can be changed in the Preferences Editing tab, in the Clips section next to Clip Gain Nudge Value. This is especially helpful if you want to change the gain of many regions at the same time: simply select all regions you want to change; the shortcut will change all by the same amount. At first, you wouldn’t suspect it, but it’s true: every time you reach for the mouse it takes a bit more time to get the job done. Get out of the editing suite faster by substituting mouse clicks for keyboard shortcuts. That will ensure you spend more time creating and less time mired in endless clicks. Want more tips to get the most out of Pro Tools? Stay tuned for more Pro Tools article on the Soundsnap blog.